We are hosting a small Thanksgiving at our house this year. I was super excited to get to create a fun tablescape for the kid’s table and the adult table. I knew for the kid’s table I wanted something simple, cute, and inexpensive so if it got spilled on I wouldn’t want to cry. 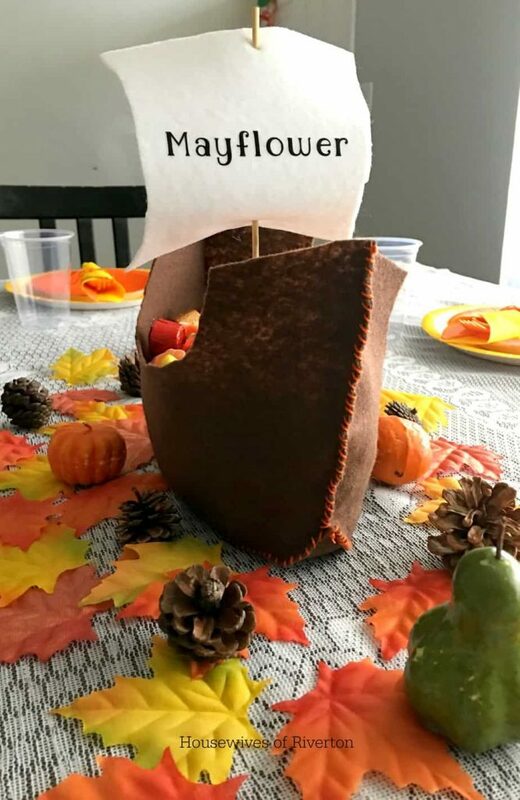 I decided it would be really fun to make a Felt Mayflower centerpiece. Of course it was the perfect excuse for breaking out my Cricut Maker. The first thing I did was draw out how I wanted the ship to look. I wanted it to be simple, just three pieces that I could hand sew together. I’ll include a picture of my very crude drawing, but it worked perfectly! Next I uploaded my pics to Cricut Design Space. You can do this through your scanner, or you can do it through the mobile app. I just scanned mine and uploaded them. It was fast and easy. Just start a new project, click on upload, click on upload image, choose your image, clean it up as needed and then add it to your project. From there, I adjusted the size I wanted for the pattern pieces. I made my side pieces about 12 inches long and the bottom piece about 10 inches long. For the sail, I made it go in a little on the sides and at the thinnest part it was about 4 inches wide. 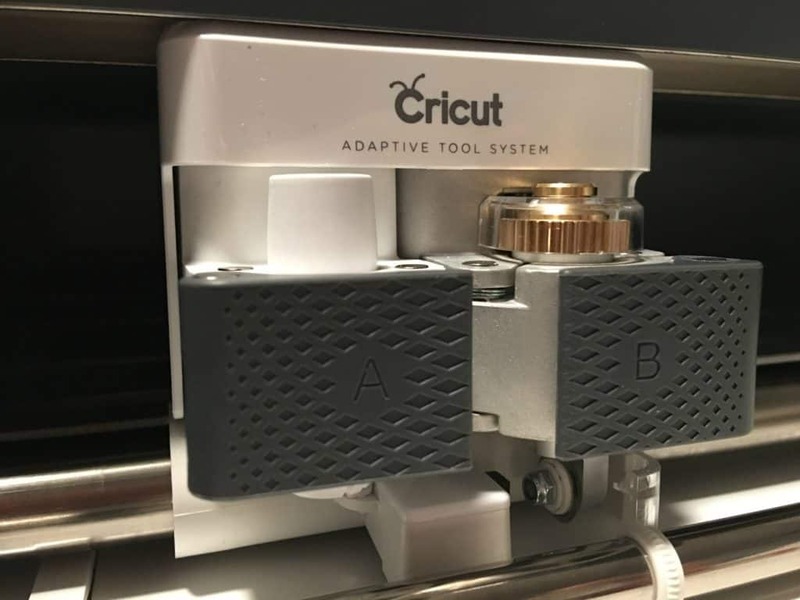 Now one of my favorite things about the Cricut Maker is the rotary blade. When it comes to cutting any type of fabric or delicate material, there is nothing better than the rotary blade. Instead of dragging through the material, it rolls over it, so the material doesn’t pull or snag at all. You get SUPER clean cuts. After you get your pieces lined up, start sewing from the top of one side. I used a simple whip stitch, you could also use a blanket stitch for a more decorative look. I worked my way down the one side of the ship, one side of the bottom of the ship and then back up the other side. Then I went back and finished the other side of the bottom, tying the ends off with a simple knot. Next, I used some black iron on and my Cricut to cut out Mayflower for the sail. Then I used the EasyPress to hit it with some heat. I added two very small holes about a half inch from the top and bottom of the sail for the wooden skewer to go through as the mast. 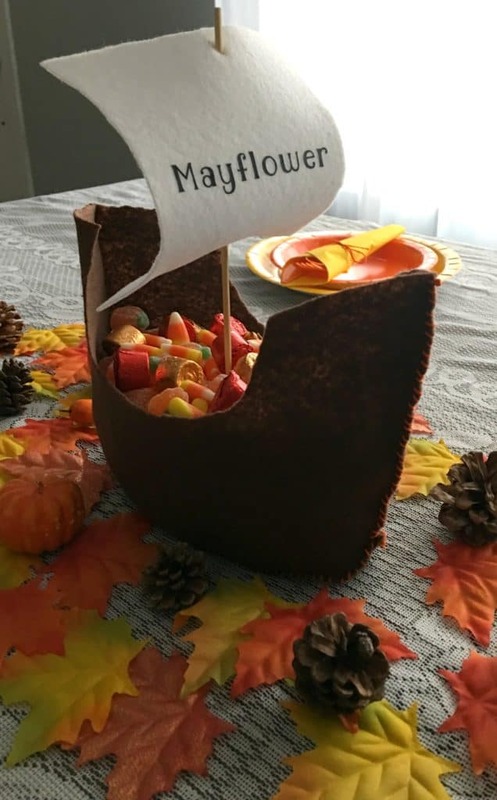 Now as much as my kids would LOVE for me to fill the entire ship with candy, I didn’t think that would be the best idea. So instead I filled the bottom third with uncooked macaroni, and then layered the candy on top of that for some Thanksgiving sweets! 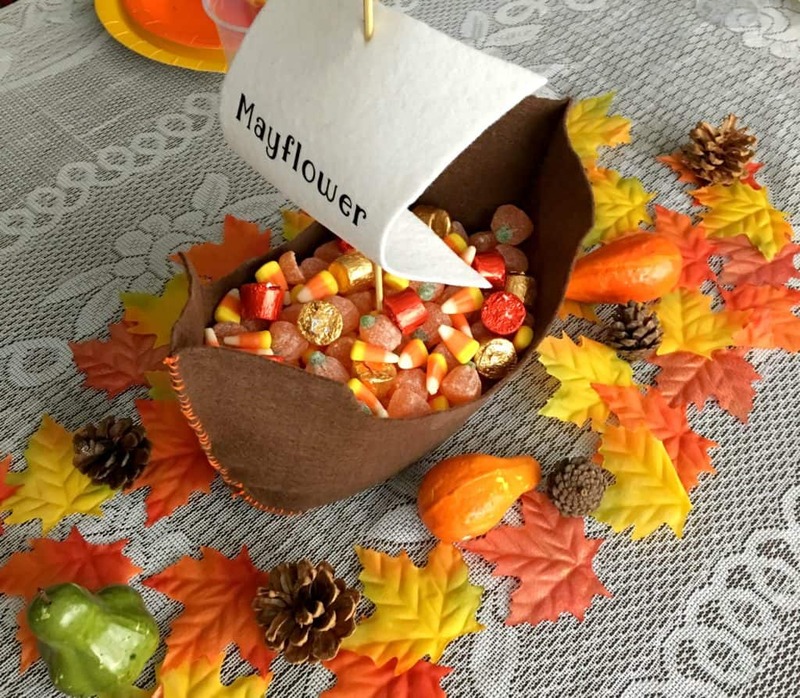 The macaroni and candy helps keep your sail upright. After that, I just added some fall colored leaves, along with some dollar store pinecones and squash. Making a pretty table is probably my second favorite thing about Thanksgiving, the first of course being the food! What do you love most about Thanksgiving? Comment below and tell us! Such a cool idea. 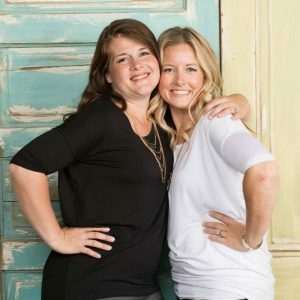 Would love for you to stop by and link this up to More The Merrier Monday.